There was a shuttle bus that connected Dunsmuir with Shasta City and would depart in one hour. Searching around for a place to wait, I found a picnic table next to the police station, and discovered that it had outside electrical outlets; while I waited, I charged my cell phone and finished off a box of cookies while sitting at the table. The shuttle arrived on time and I climbed aboard, placing my pack in the seat next to me. The fare was two dollars and I was the only passenger aboard. The driver, who looked a bit like Santa Claus, was friendly and I told him I would like to be let off at the Travel Inn in Shasta. He said he knew exactly where it was and would do as I requested; the twelve-mile ride to Shasta passed quickly, and within twenty minutes I was standing in front of the Travel Inn in downtown Shasta, my home for the night. The motel had a 1950s look to it - small courtyard ringed with small apartment-sized units with outside wall-mounted air conditioners. The front rental unit has been converted to an office and living unit for the manager and his family, which in this case consisted only of a husband and wife. The motel may be from the fifties, but the nightly rate was more modern. The rate for a nonsmoking room, plus tax, was eighty-two dollars, which for my frugal mind-set that is content to sleep outside in the woods, was excessive. The manager was from India, as are many motel managers I have met in my travels, even as far back as the 1980s when I biked across America. I asked the manager why he thought members of his ethnicity tended to gravitate towards the hospitality industry. His English was good, but I couldn’t get a straight answer from him, so I was still left to wonder. The manager escorted me to my room and opened it for me to validate his claim that it was a nonsmoking room. I thanked him, walked into the room, and dumped my pack and trekking poles on the floor. As I stood there in the middle of the tiny room and surveyed my surroundings, I contemplated the term "nonsmoking," and couldn’t help but marvel at what a significant advancement society has made in relation to this fundamental quality of life. Momentarily, into my mind flooded memories of riding in Greyhound buses when smoking was permitted, of flying in airplanes when smoking was permitted, and attending outfitter meetings in Moab, Utah, and Salmon, Idaho, when smokers, without even a hint of consideration for others, would light up and turn the room blue with cigarette smoke, leaving the nonsmokers gasping for fresh air and rushing to open every available window. I am so grateful we’ve moved beyond those archaic times. As a river outfitter in the 1970s through the 1990s, Moab, Utah, was my home base, which was also the location of Canyonlands National Park, Arches National Park, and the Colorado River. The scenery around Moab is world-class and is the primary attraction for visitors from all over the world, as well as the film industry. In every respect, Moab, and its red-rock country symbolizes and embodies the idealism of ruggedness and imagery of the American Old West. And it was for these attributes that Philip Morris, the makers of Marlboro cigarettes, descended upon Moab, beginning in the 1960s, to use the red rocks of Canyon Country as a backdrop for their new ad campaign. The idea behind their brilliant marketing campaign was to bring groups of young people to Moab, split them into teams and have them compete in adventure activities such as four-wheeling, canyoneering, rafting the Colorado River, and racing dirt bikes across the desert sands. All the while, the cameras were rolling, and the end product was a fast-paced, exciting adventurous movie clip that was played again and again in theaters in Europe, Asia, and Latin America, where restrictions on cigarette advertising were virtually nonexistent, and always with the subtle and underlying theme; if you smoke Marlboro cigarettes, you too can be a cowboy and live the Old West adventure. 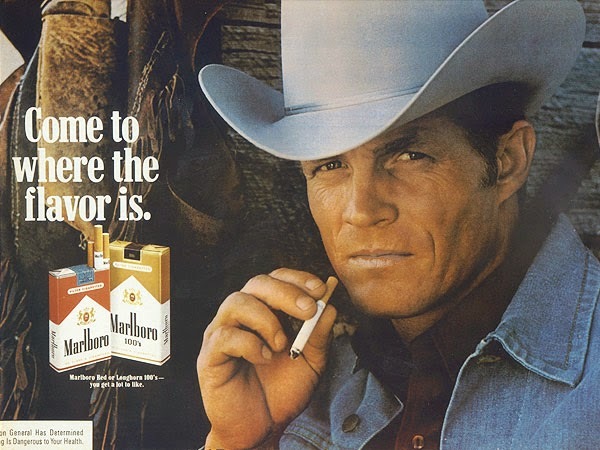 Eric Lawson - iconic Marlboro Man died in 2014 of chronic obstructive pulmonary disease. I met Veggie on the trail, and he's still wearing the same cotton t-shirt. He's trying to make it last until the border crossing.